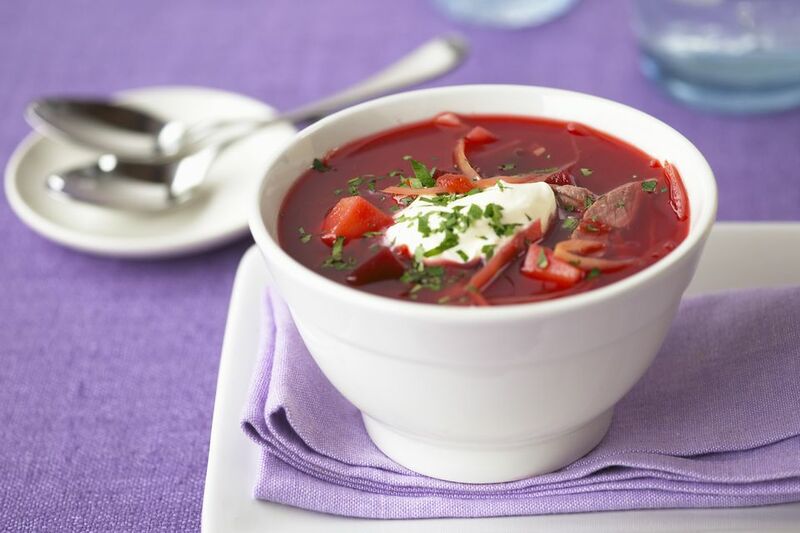 Technically, borscht is any stew-type of soup. The best-known kind in the U.S., however, is made with beets and is a brilliant red color. This beet borscht includes cabbage as well; it is packed with roasted red beets, onions, cabbage, and white beans—a perfect stew for making it through a cold winter night. Homemade chicken stock adds a depth of flavor missing in canned varieties, but this soup is tasty even when made with plain old water for a delicious vegetarian version. This recipe makes enough for a crowd but also freezes extremely well, and is a treat to pull out of the freezer and heat up after a long day's work. It is particularly satisfying to devour on a snowy or rainy night. Put the beans in a large pot and add cold water to cover generously. Bring to a boil, cover, turn off heat, and let sit 1 hour. Drain and return the beans to the pot. Cover again with cold water, bring to a boil, reduce heat to keep a simmer, and cook until beans are tender to the bite, about 20 minutes. Drain the beans and set them aside. Meanwhile, preheat oven to 350 F. Wrap the beets in a large sheet of aluminum foil, place on a baking sheet, and cook until tender when pierced with a fork, about 45 minutes. Let the beets sit until cool enough to handle. Peel the beets (their skins should slip off easily after being roasted) and grate them on the large-hole side of a box grater. Set aside. In a large pot over medium-high heat add oil, onions, and salt. Cook, stirring occasionally, until the onions are soft, about 3 minutes. Add the garlic, if using, and cook until fragrant, about 1 minute. Add the cabbage, stir to combine, and cook, stirring occasionally, until the cabbage wilts, 3 to 5 minutes. Add the caraway seeds and grated beets. Stir to combine. Add the broth and bring to a boil; reduce the heat to maintain a steady simmer, add the beans, and cook until the vegetables are tender and flavors blend, 15 to 20 minutes. Add salt and lemon juice, if using, to taste. Serve hot, with a dollop of yogurt or sour cream and a sprinkle of dill, if you like.